Over time there have been changes to borders through wars and negotiations, countries merging and separating and disappearing altogether. Consequently there is a history of countries participating at the Olympics that no longer exist or no longer compete under that name. Also on several occasions Olympic specific teams have been created, mixed teams with athletes from more than one country participating. Some countries have simply changed the name they were called, see the List of Past Names. See also the list of all countries that have ever participated at the Olympic Games. Some regions of the world have been taken up by others, such as the regions of Saarland and Bohemia. The Saar existed from 1947 to 1956 in part of Western Germany that was occupied by France, and only competed at one games in 1952 before joining Germany. Bohemia athletes competed at the Olympic Games between 1900-1912. After World War I, Bohemia became part of the new Czechoslovakia. Later, after the dissolution of Czechoslovakia in 1993 into the Czech Republic and Slovakia, Bohemian athletes competed for the Czech Republic at the Olympics. For various reasons, there have been teams at the Olympic Games that are made up of combined countries. In the first few Games, Mixed Teams were allowed to compete where individuals in a team could be from different nations. For some unknown reason, Australia and New and New Zealand sent a combined Australasia team to the 1908 and 1912 Olympics. The United Arab Republic was a short lived union for the 1960 Games between Egypt and Syria, and in the same period the West Indies Federation was a experimental joining of Jamaica, Trinidad and Tobago and Barbados. It is not surprising that closely related countries once competed separately, such as North Yemen and South Yemen, who are now harmoniously competing as Yemen. The separate East Germany and West Germany briefly united as the Unified Team of Germany, and permanently joined and competing as Germany from 1990. South Vietnam competed on their own between 1952-1972 during the time their country was partitioned. North Korea and South Korea have never competed as one, but they did enter the stadium under one flag in 2000. Malaya competed at the Olympic Games in 1956 and 1960, before expanding their borders to include North Borneo and for a short time Singapore, and competing as Malaysia. Crete once sent their own athletes to the Olympic Games before joining Greece, Newfoundland early on sent some athletes but is now part of Canada, and Netherlands Antilles has recently joined The Netherlands. The Soviet Union (USSR) had a very successful period of Olympic participation before it was dissolved in the early 1990, then competed as the Unified Team in 1992 and now each of the regions compete under their own name: Armenia, Azerbaijan, Belarus, Georgia, Estonia, Kazakhstan, Kyrgyzstan, Latvia, Lithuania, Moldova, Russia, Tajikistan, Turkmenistan, Ukraine and Uzbekistan. The nation of Czechoslovakia too had a long and successful Olympic history from 1920 until splitting into the Czech Republic and Slovakia in 1993. In 1991, Yugoslavia slit up and the independent countries of Slovenia, Croatia, Bosnia and Herzegovina, Macedonia, and Serbia-Montenegro were formed. Serbia-Montenegro was later split into Serbia and Montenegro. 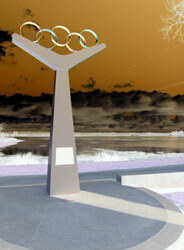 see the List of Past Olympic Country Names.